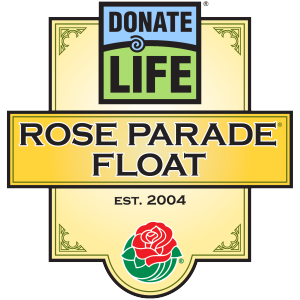 2018 Donate Life Rose Parade Float – It’s About Time! Each year, the Donate Life entry in the annual Tournament of Roses Parade inspires viewers as a stunning representation of the lifesaving power of organ, eye or tissue donation. Click here to meet this year’s Donate Life Texas Float Rider, Dot Delarosa! 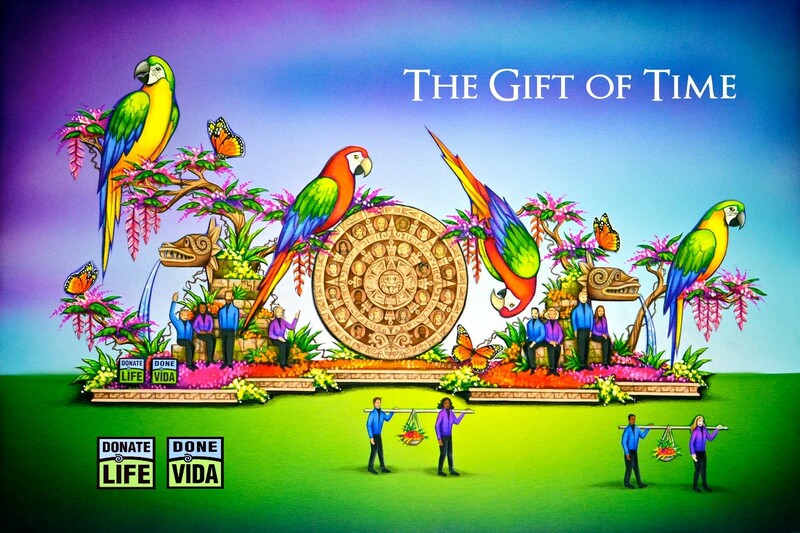 This year’s Donate Life Rose Parade Float entitled The Gift of Time reflects the parade’s theme of Making a Difference by celebrating the power of kindness and the generous acts of people throughout the world, who are making a positive difference in the lives of others. Perhaps no act is more emblematic of this than becoming an organ or tissue donor: a single organ donor can save the lives of up to eight people and improve the lives of as many as 75 more by donating their corneas and tissue. Celebrating its 15th year of participating in the parade, the Donate Life Rose Parade float is the centerpiece of a national effort of more than 50 organizations, including Donate Life Texas, to reach a broad audience with the simple, life-giving message that organ, eye and tissue donation saves and heals lives. The Gift of Time float depicts a vibrantly colored, tropical backdrop that dates back to the ancient civilizations of Mexico. It celebrates the gift of life as 16 costumed riders sit alongside the jungle, against stone carvings, drawing on the strength they have gained from their donors to continue and thrive on life’s journey. The monumental Aztec calendar draws the eye to the center of the float, where 44 donors are honored with floragraphs. This ancient calendar is a reminder of the enduring, life-saving power of the generosity of donors and families. Alongside the float, eight living donors and recipients will carry baskets of fruit and flowers in celebration of the renewed life they have shared with one another and the world. The beauty, richness, and potential of life is represented by the vivid flock of macaws perched over the lush floral canopies, ready to take flight. The Donate Life Rose Parade float is produced by OneLegacy and is made possible thanks to over 50 sponsoring donation, transplant, healthcare, and family care organizations and individuals who help make donation and transplant possible across the country, including Donate Life Texas and Dignity Memorial Houston who will each honor Texans on this year’s entry. Please watch Donate Life Texas’ social media for exciting announcements. Other Donate Life Rose Parade Sponsors include: American Association of Tissue Banks (AATB), Alabama Organ Center, American Donor Services / VRL – Eurofins, ARORA, Axogen, CryoLife, Community Tissue Services, Dignity Memorial Las Vegas, Dignity Memorial New Jersey, Donor Network West, Donor Alliance, Gift of Life Michigan, Indiana Donor Network, Iowa Donor Network, JJ’s Legacy, Life Alliance Organ Recovery Agency, Donate Life South Carolina / Sharing Hope of South Carolina / LifeShare Of The Carolinas, LifeShare OK, LifeSharing, LiveOnNY, LOPA, Midwest Transplant Network, New England Donor Services, NJ Sharing Network, OneLegacy, Promethera Biosciences, RTI, Trenton’s Legacy, UCLA, UNYTS and XTANT Medical.